A FEW MAYBE A LOT OF SPOILERS !!!! Love Burn had me sad, emotional, mad, happy All at the same time I was fussing and everything lol, especially with Noni because she kept going back to Dom. Like girl, please stop I was making mad faces, saying, girl, If you don’t get with Mercy, and finally he hit it, but it was ruin with Tate stank *** glad the ending came out good because she ended up with Mercy even though she lost another baby again. I felt like she lost that baby due to “stress, drinking, taking them bottles of pills, crying,” bad enough she tried killing herself twice. And then was pregnant during the second accident, the second accident had me weak though because she drove the car into his house and tried running over him I’m like girl she made me mad though throughout the whole thing because she was pregnant but was whiny when she lost the baby towards the end. But through this entire book, Noni best friend Tate and own husband Dom were shady asl. When he got home and seen she left I was dying laughing. Also, I wish this book didn’t go from present to the past and the past to present ugh. Should’ve done past first and then present. But the book was still good, glad it stopped with the past BS. Dom was piss when he found out about Mercy and Noni; I’m like KARMA’S a ***** isn’t it? I was like Mercy should’ve cuff his lady because he (Dom) kept own calling Mercy to fix his relationship (with Noni) so, what did he expect to happen?. Plus Mercy was feeling Noni anyway. I am against cheating but look I was like boy if you don’t go and get her, I was even angry when she found she was HIV positive. And she didn’t want to be with him, and he still wanted to be with her, I was hot lol, I am like girl if you don’t get your stupid self-own somewhere, man he wanted to be with her regardless of her being HIV positive but in the end she wasn’t’ positive but negative. I did wonder if Tate did something to her test to make it positive. Because Dom was negative, and I was like how’d he be negative when she was positive, and Tate *** got that KARMA back good lmao. In the end, she still didn’t get Dom but got killed, Oh WELL > Oh, by the way, (this book Love Burn is part 1-4, I was confused at the beginning of it. When Noni married the love of her life, she finally thought she would get everything she deserved. Riches, success, status, influence – she had it all as the wife of Mr. Dominick Meyer. But there is more to her title than meets the eye. When she catches Dom cheating and discovers that he isn’t the businessman he portrayed himself to be, her life is changed forever. Finding out that their wealth was amassed from drug money and that Dom has never truly been faithful, she wants out. With a messy divorce pending, Noni empties her husband’s bank accounts and goes on the lam in an attempt to run away from her daunting reality. She never expected to find a new love along the way. But when Dom comes knocking and a debt has to be paid, her world spirals out of control. 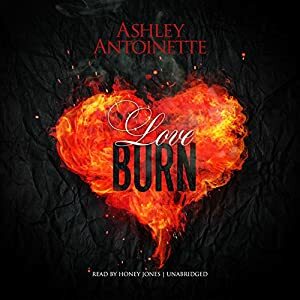 Join Ashley Antoinette as she pens an explosive short story series that takes you through love, loss, truth, lies, drugs, money, and death. Love has a way of leaving you burned in the end, and Noni only hopes she can escape its clutches unscathed.